As a local Mental Health champion, one of the things I have worked away at is to achieve constructive media coverage. Councillors know that the local press can be a nuisance but also an important aid. The main newspaper serving the City and District of St Albans is the Herts Advertiser. It’s delivered free to most but not all homes and can also be purchased. Their group editor has run a lot of stories over the years on mental health: about the inadequacy of CAMHS; covering public meetings on mental health; reporting fund-raising efforts by schools for local mental health charities and the Council’s adoption of the Employer’s Pledge. The newspaper has now embarked on a series of articles under the heading ‘It’s Okay To Say’. I contacted the editor thanking him for the initiative and he responded by offering an interview the results of which are below. It’s generated quite a few approaches from voluntary sector organisations who are encouraged by the commitment of the Council. 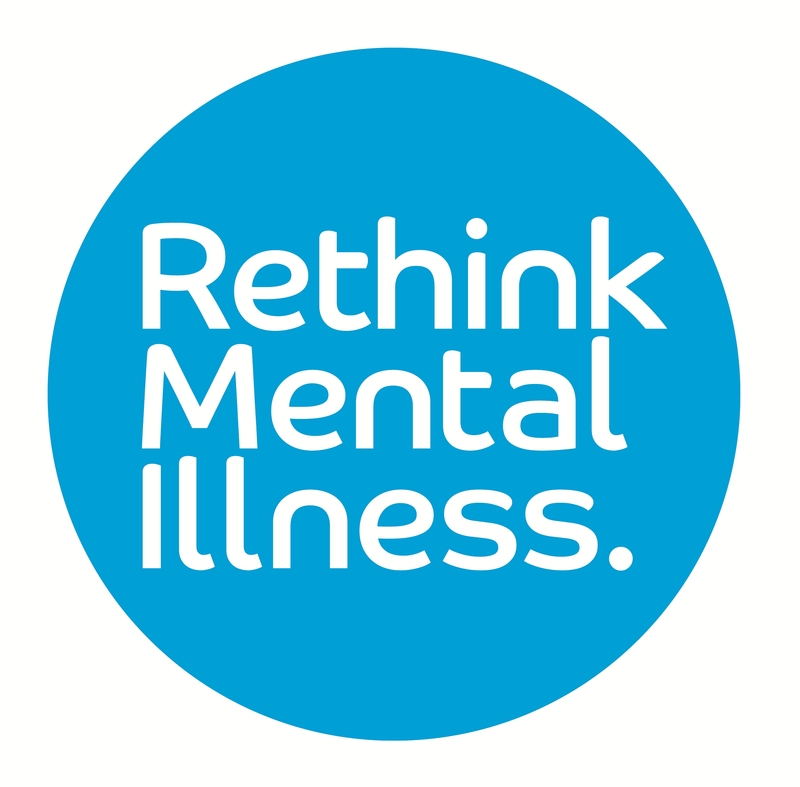 District and county councillor Anthony Rowlands came into the role three years ago, when he signed up to the Local Authority Mental Health Challenge - a scheme coordinated by seven major mental health charities led by the Centre for Mental Health. He works to improve the district’s mental health services by raising awareness, challenging stigma, encouraging good practice and fostering links between organisations. 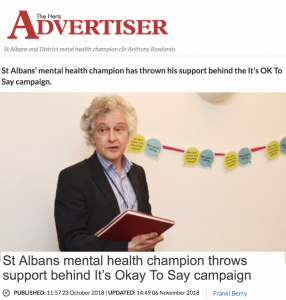 Two weeks ago, the Herts Advertiser partnered with leading anxiety specialist Stacey Turner to launch a campaign encouraging people of all ages to speak out and seek help if they are struggling in life. Cllr Rowlands said: “For generations, mental health has been a Cinderella within the NHS and not spoken about in the world at large. “Priority was given to other specialisms in health and as a result, mental health services have not been as strong as they should have been and funding was not available. He highlighted a worrying decrease in the number of trained psychiatrists - a 2017 report from The Royal College of Psychiatrists revealed that the number of psychiatrists working in children and adolescent mental health services fell from 1,015 in 2013 to 948 in 2017. Cllr Rowlands added: “At the same time the number of referrals for anxiety, depression, eating disorders and other conditions continues to rise. And we know that untreated or unrecognised early intervention among children and young people is much more likely to manifest itself in problems in adulthood. He has a deeply personal reason for supporting the campaign, as his wife of 32 years took her own life in January 2014. “Harriet was a totally devoted mother to our children, Alice and Sam, a revered, talented and much loved teacher of drama and English to generations of students at Beaumont School and a loyal and remarkable friend to countless people locally,” he said. Having lived through that trauma, Cllr Rowlands is working to establish systematic support for bereaved people of suicide around Hertfordshire, which at the moment is “random and unreliable”. He encouraged everyone to attend a joint meeting of two St Albans district council (SADC) scrutiny committees on November 13, when the St Albans Youth Council will make a presentation. The young people have spoken at the council before: “They spoke about their own personal experiences with an honesty and candour - of experiences that a person of my generation has not got anywhere near. “Young people are prepared to talk in an informed and concerned way and that in itself is extremely beneficial to their fellow students. For World Mental Health Day on October 10, there was a drop-in session at St Albans Civic Centre for anyone who just wanted to talk. Cllr Rowlands said about 60 people popped by: “It was another opportunity for people to feel they can talk about something, whatever it was. There are numerous charities for anyone who needs help. Cllr Rowlands highlighted the work of Mind In Mid Herts, Samaritans, Youth Talk and The Counselling Foundation. Follow the It’s Okay To Say campaign on Facebook, Instagram @its_ok_to_say, and Twitter @ItsOKToSayUK.